Acupuncture has been used for centuries and has proven helpful for pain, arthritis, weakness, chronic illnesses, immune system issues and more. Only fully-qualified Veterinary Surgeons are allowed to perform Acupuncture on pets, and they undertake specialised training to do so. - "Following her acupuncture treatment I was able to reduce treatment for epilepsy by half" (Abbie, an 11 year old labrador). - "We tried acupuncture as a last hope after conventional medication was at its upper dose limits. We were sceptical about acupuncture but have not looked back. Alternative and conventional working together” (Rocky, eight year old, German Shepherd Dog). - "Acupuncture was a real success... it bought us extra time" (Jessie, fourteen year old x-breed). We believe in offering the best for your pet. Conventional treatments are extremely effective for most diseases and conditions. However alternative therapies are increasingly being shown to offer extra benefits for pets with certain disorders, just as they can for people. At Broad Lane Vets we recognise the growing importance of complementary therapy, and work closely with local hydrotherapists and physiotherapists. 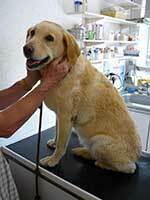 In addition, we are unique in offering Acupuncture for pets, being the only vets in the area providing such a service. Richard Webb BVSc Cert AVP MRCVS qualified as a Veterinary Surgeon from Bristol University. He has a particular interest in using alternative medicine in conjunction with conventional medicines to improve health and happiness. 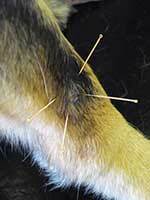 Richard is a member of the Association of British Veterinary Acupuncturists. What conditions can respond to acupuncture? admin@broadlanevets.co.uk or call on: 02476 464789.